HOUGHTON — Every year, the Michigan Tech and Northern Michigan University football teams engage in a tight battle to land Upper Peninsula recruits. Just like recent annual gridiron wars, the Huskies edged out the Wildcats. Tech notched nine U.P. players to NMU’s six and also added two local walk-on players. Westwood will send three players to the Copper Country in quarterback-running back Nathan Beckman and lineman Sam Gilles, along with fellow lineman Blake Hewitt as a preferred walk-on. Beckman was an Upper Peninsula Sportswriters and Sportscasters Association Dream Team selection and a three-time all-Mid-Peninsula-West PAC honoree at defensive back, while Hewitt is a two-time Dream Teamer. Gilles is also a two-time Dream Teamer and was named the Large School Defensive Player of the Year and the Mitchel Snyder Lineman of the Year this past season. According to the Huskies athletic website, Hewitt will remain an offensive lineman, while Beckman becomes strictly a defensive back and Gilles moves from the line to the backfield as a fullback. Marquette Senior High School has two players becoming Huskies. Speedy wide receiver Ethan Martysz and lineman Alex Cannoot will remain teammates for another four years as both will remain at the positions they played at for the Redmen. Martysz blazed up the field as a two-time Dreamer and was all-state honorable mention this last season, while Cannoot was an All-Great Northern Conference winner and GNC Lineman of the Year. 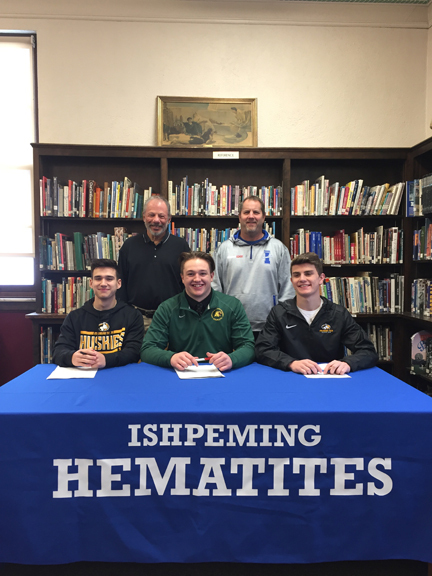 Ishpeming also had two players sign with the Huskies, one on scholarship and another as a walk-on. Hematites receiver-kick returner Hunter Smith was a Dream Teamer at defensive back and All-U.P. kick returner. He’ll join Martysz at the receiver position. Teammate Matt Trawick appears to be a walk-on and he was an All-U.P. Small School honoree at linebacker last season, but his position has not been listed yet on the Huskies site. 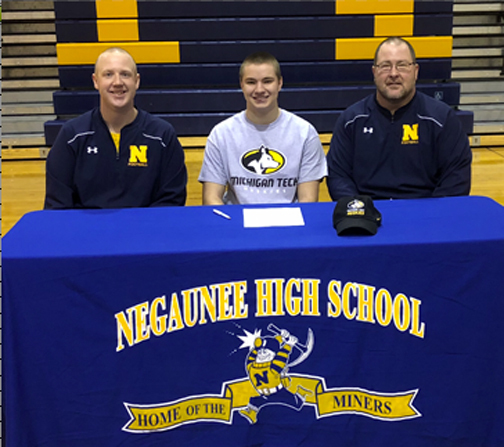 Gwinn and Negaunee both had one recruit sign with Tech. Modeltowners tight end Tucker Taylor will stay in his spot at tight end after being twice an All-U.P. honoree and two-time all-stater. And the Miners’ Theo Kumpula will also be a tight end after being a three-time varsity player. Kingsford running back Luke Terrian and Dollar Bay kicker Brendan LeClaire are also going to MTU. Terrian made the Dream Team last season at his position and will stay there this fall with the Huskies.